Chicago, Illinois. 1902 $10-$10-$10-$20 Date Back. Uncut Sheet of (4) Fr. 616/642. The First NB. Charter #2670. 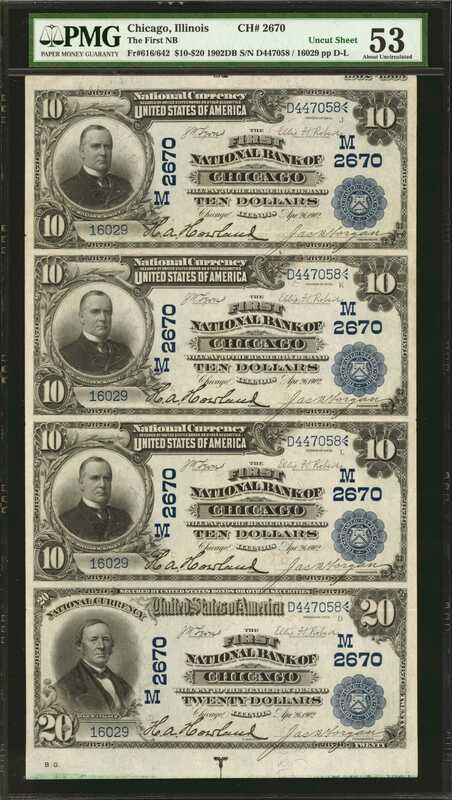 About Uncirculated 53.A visually stunning uncut sheet of these Cook County notes from Chicago, Illinois. According to the National Bank Note Census, until this discovery, no uncut sheets were known. Perfectly clear inks throughout with vivid penned signatures. Deeply embossed overprints and free from circulations, save for a few minor sheet folds. An important item which would be a great addition to any collection.